If you’ve ever asked yourself, “Where can I get a nice shirt for my dog that is stylish AND shows the world how much I love Moderation Town?” then wonder no more. 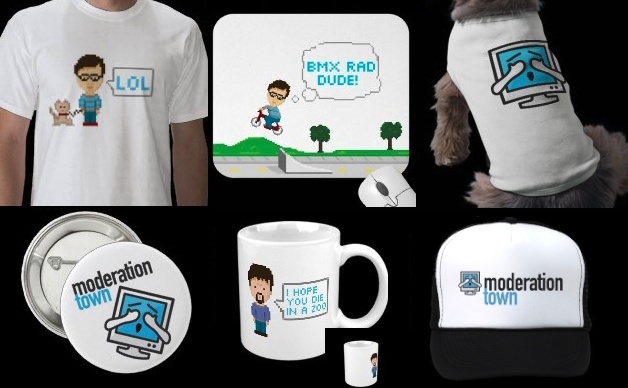 We’ve put together an awesome online store for Moderation Town swag at Zazzle. There you will find mouse pads featuring an 8-bit rendering of Alex on a BMX, mugs with Darryl wishing death upon you, trucker hats with our “shocked computer” logo, shirts that remind you to “Do the bing”, and much much more. Perfect for wedding gifts, graduation gifts, funeral gifts, Valentines Day gifts, Secretary’s Day gifts, Fathers Day gifts, birthday gifts, etc. Visit the store now and don’t forget to tell your friends.